The £4 Wasteland Workshop DLC looks set to be a bit of enjoyable fluff ahead of the meaty Far Harbor next month. Coming April 12, it'll cost you £4 if you don't own the season pass. While features like additional decorations and planters for crops have been accomplished by modders already, there's some flair on display that's should appeal to the homemaker in you. Return to the age of technology with concrete building materials and gadgets like decontamination archways, then head right back to savagery with new traps straight out of Saw. I wish there were invading players to test them against. On the main stage, however, is the ability to capture Wasteland critters and make them fight like post-apocalyptic Pokémon. 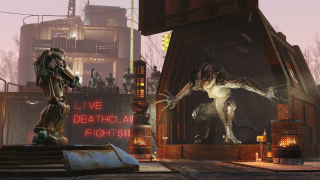 You ask why, but aren't you a little curious to know what would win in a fight between a deathclaw and Marcy Long? I know I am.